I’m sure most of you are thinking that when it comes to upscale shoe designers I’m partial to Christian Louboutin. Well, you are correct. However, today I’d like to discuss a popular shoe designed by the famous Valentino. The shoes name? RockStud. I’ve seen many celebrities wearing this shoe, and there are numerous imitations of this shoe at various retail stores. The shoe comes in various colors, but the design is constant- pointed toe, studs across the top of the shoe to enclose your foot, and studs on the ankle straps to secure your foot in the shoe. Here’s the kicker: I don’t like the shoe. No matter how popular it is, no matter how many times I’ve seen people wear them, I’m just not a fan. Now in the picture below the shoe looks fairly decent on the foot. I guess it’s just that on some pictures I’ve seen, the person’s foot looks like it’s being swallowed by the shoe and the ankle strap looks too big. I think the shoe must 1) Fit snuggly, but comfortably and 2) Be styled correctly. What do you all think? Am I being too critical? 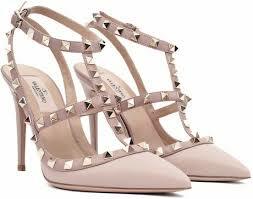 Should I embrace the Valentino Rockstud?